I thought they didn't have this film on my flight, though it was on my outbound journey, but actually it was hidden away in the 'for kids' section. Not sure why it wasn't in 'family movies' this time. Anyway, I found it and watched it as a final relaxing film, and it fit the bill just fine. Light entertainment with some smiles, if not the big laughs of the first films, and impressive action. This time around, Po has to face an undead bull voiced by JK Simmons who was once the close comrade of the old turtle master Oogway. He uses Chi to enslave the various animal masters around China, turning them into chi zombies made of jade. Because Chinese-y, I guess. 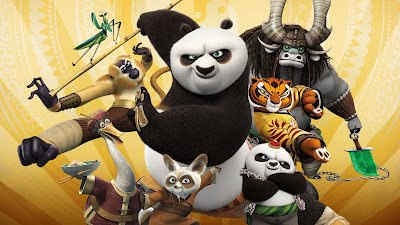 Po goes on a quest to understand himself after meeting his birth father, intending to master Chi to fight this new threat. But he only learns to be a panda, obviously neglecting that being raised by a duck, that's not fully who he is. There's a nice big satisfying fight at the end, where for some reason the baddie doesn't use the instant-inslaving technique that worked on everyone else, There's some spectacular animation in the fights and in Po's clever idea for dealing with the baddie, and everything gets wrapped up neatly. The stakes just about work, though perhaps a larger scale would have been more moving. There's a very sweet gesture of help at the end, and overall the film ends as satisfying but not quite as grandiose as its predecessors - which were of course very silly in any case. It's obvious why this franchise worked out so well, able to encompass silliness and awesomeness together, And of course China likes it. A trilogy is neat and the idea might get tedious after too many more iterations, but I could stomach at least a couple more.